Sri Mangesh temple is a famous temple located in the Ponda district in Goa. 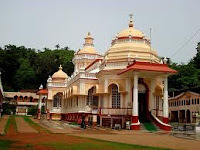 This beautiful temple is dedicated to Lord Shiva. The lovely temple attracts lots of devotees and the architecture of the temple follows every norm of the traditional Hindu architectural style.